It is best to take the time to admire how the blades from the Silver Throwing Knife Double Set gleam in the light, because once they start moving, you are not liable to see them again until the blades are driven deep into the target. Each of these knives possesses a classic blade design that takes a narrow leaf-shape and transforms it into a deadly, curved edge that features an effective point that is made to be driven into a target, whether it is wood, foam, or anything else. The knife is made from one piece of stainless steel that has a polished finish, while also featuring several machined cutouts that help to reduce the weapons weight on the handle, ensuring that all the weight goes into maintaining a proper rotation and balance when thrown. The knife set includes 2 throwing knives and 1 nylon sheath, which is perfect for holding the knives together, whether at your side or in storage. Each knife measures approximately 7 inches long. 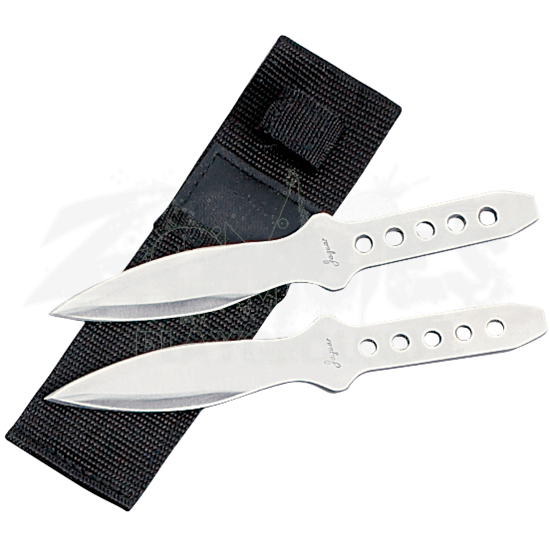 Time, effort, and this Silver Throwing Knife Double Set will help to transform anyone into a knife-throwing master capable of putting one of these gleaming silver blades right where they want it to go, every time they throw.